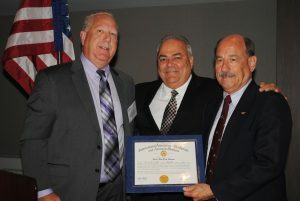 GVP Sito Pantoja and District Lodge 142 President Dave Supplee last week honored two IAM members at the District Lodge 142 Biennial Convention. Ron Miller and Chic Kavros were presented awards for their lifelong contributions and service to the IAM. Brother Miller has been an IAM member for five decades. After first becoming a mechanic, he turned his focus to airline safety. He dedicated so much of his time addressing safety concerns, the union selected him to be a part of the safety committee. He helped write the safety program for US Airways and aided in securing several other safety improvements, including uniform improvements. Brother Miller also assisted in creating the Joint Labor/Management Safety Symposium, which currently meets every quarter to share safety information. Brother George “Chic” Kavros joined District Lodge 141 in 1949. He served as President of Local Lodge 1976 for 9 years before becoming an Assistant General Chairperson for 29 years. Kavros retired in 1990, but his work didn’t end there. Since his retirement, he has assisted in negotiations, steward training, grievances, arbitrations, meetings and rallies. He also taught arbitration classes at the Winpisinger Center. 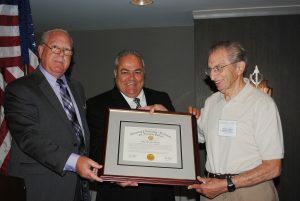 Kavros is the namesake of the DL 141 George “Chic” Kavros award for retiree volunteers.